Our publisher, Bob Fox, shares his perspective on the industry’s search for a new standard for measuring the performance of space. To share which measures represent the most value to you and your business, comment below. Illustration from Mode-Maker Metal Business Furniture Catalog, circa 1960. Square feet per person (SF/person) has been the industry standard for measuring office space efficiency for as long as most of us can remember. But, in today’s rapidly changing workplace, the concept of SF/person doesn’t provide the complete picture. Now, the industry is searching for a new, more consistent standard to measure the performance of space. The concept of measuring office space has long been based in the primary unit of measure: the square foot. Back in the mid-‘80s, before we had wireless and the cloud, people had to come into the office to connect with colleagues and the necessary information to get things done. As the cost of office space rose, the efficiency of the space became much more important. And — at a time when costs were much more closely tied to the number of people and the amount of space — the measures were pretty consistent and easy to calculate. When you looked at office space that was 200 SF/person, it actually meant something, and it compared consistently with other spaces. It was a simple measure of efficiency. But today, SF/person is a measure that has lost much of its value and doesn’t really give us a clear picture of what we need to know, which is how well is the workplace is performing. Today, SF/person is a measure that has lost much of its value and doesn’t really give us a clear picture of what we need to know, which is how well is the workplace is performing. Nowadays, a square foot doesn’t really have much connection to any business measure, unless you are in the commercial real estate business. Most businesses have some productivity measure: sales per person, revenue per person, items shipped, products sold, etc. But SF/person is only a valuable measure when you are comparing the relative amount of space required to house people to a benchmark or standard, or maybe a specific component of the workplace to others. And workplace flexibility is making this measure obsolete. In in a flexible work environment, things move: the space can change, expand, contract, or increase in variety, it might be dedicated to specific activities, be assigned or unassigned, or bring people together communally. Work is flexible, but square feet? Not so much. 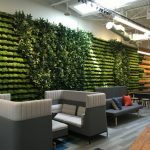 Walls can move, too, and now the flexibility of leases (e.g., spec suites, shared support spaces, and apps like LiquidSpace) are blurring the lines. A long-term lease might only represent a portion of an organizations actual space occupied. People also move around much more in flexible spaces, and there has been a shift from personal “owned” space to more shared communal spaces. So measuring the amount of office space to people is becoming an increasingly complex challenge. As a result of this increased flexibility, we have been freed from our desks. People are moving in, around, and out of the office. We no longer need to be at our desk or in the office to get our work done, so the population of an office can change dramatically from day to day, becoming a challenge for measuring the performance of static office space. The space could now be supporting people who might not show up. Furniture moves, as well: desks, chairs, and tables are flexible, lightweight, and can be easily reconfigured. The furniture can take on many different functions, connect or disconnect, and adapt to multiple tasks and teams of people. Through all of this change, measuring the true performance of a space has become more complex. It’s often a moving target. One thing that has remained relatively static is the number of seats. Even with more contemporary layouts and the ability to move the furniture, the actual number of seats tends to stay relatively constant, and it’s become common to see metrics related to the number of seats (cost per seat, SF per seat, etc.). While people are moving from task to task, seats can provide a measure of efficiency that is fairly consistent, based on current conventions. This measure solves a number of issues and might be a better measure of efficiency. But, as the industry continues to grow, and technology continues to evolve, we’ll continue to see rapid change – even in something as basic as a seat. If you think about a seat traditionally, you think that a seat is a chair at any desk or workspace. But if you think about the work that really happens in a workplace, you know a lot of it doesn’t happen at a desk or in a chair. As a result, the definition of a “seat” is changing. Workspace has shifted dramatically from private “me space” to open and shared “we space”. If we look at current ratios of me:we in today’s modern office space they are very close to 1:1. We are spending less time in our offices – at our seats — and more time with others in meeting and collaboration space. On top of all that, we’re also in an interesting period of time where we are learning that sitting for long periods is unhealthy, and not conducive to great performance. So the very nature of seats and sitting is being called into question. In response to that knowledge, we now have treadmills that are built into desks, a growing number of stand-up desk options, and other conditions where works gets done, but there’s nowhere to sit. Still, in most cases, we would all agree to count those spots as seats. If the definition of a seat is blurred, the new questions becomes: How do we define a seat in the workplace that we can use to measure performance? I’m afraid that if we consider a seat as a chair at a more traditional desk or workspace, we are missing much of the true performance that is occurring and not capturing the full capacity or functionality of the workplace, let alone the potential. If you think about the work that really happens in a workplace, you know a lot of it doesn’t happen at a desk or in a chair. Paralleling the evolution of seats is the evolution of mobile devices, and as more and more of them enter the workplace, interacting with our colleagues “in the office” might not require our physical presence. Remote tools like iRobot and Google Hangout offer the ability to attend meetings and to actively participate without actually being there. Think about it: no employee and no chair, but functionally, the workspace is performing as though the chair and the person are present. So would you count that as a seat as we think about it today when considering the performance of that organization/location? Given the ongoing and changing nature of work, technology, furniture, and work environments, the definition of a seat needs to adapt. It should include more innovative conditions, the places where work actually transpires, and the apps and devices that enable it. It should also include meeting, collaboration, and amenity space where work can be done. A physical seat isn’t required in any of these conditions. We could debate the nature of virtual seats, but I think that they are here to stay. They impact the performance of the space and the organization, and will become a defining characteristic of workspaces in the near future. The relative ratio of seats by type is important to consider to give us a more clear picture of the workplace. We have a long and increasing list of different types seats, such as private office, open workstation, and benching, but workplace specialists can no longer ignore the changing nature of work and the tools associated with the physical workplace. Work is evolving and the space and the tools that support are changing right along with it. We’ve gone from measuring square feet per person, to square feet per seat, to people per seat, and soon we could be measuring apps per device per person per seat (say that ten times fast). Never miss an expert insight! Subscribe to our FREE weekly newsletter to get exclusive Work Design Magazine content in your inbox every Monday morning. Is Sitting at Work Killing Your Creative Mojo? Great article! I am looking forward to seeing how measures of space will be determined as workspace evolves and how workplace strategists will collect and gather these measures. As technology (apps and all) integrate more into workplaces, I am curious if measures will be driven by data analytics and relayed more accurately to give a dynamic state of the work environment. The challenges that come with finding new metrics will highlight insight that has been concealed under the static (sqft/person) measure. My company, Citrix Systems, is in the business of allowing people to be connected to their “office” from anywhere. We also encourage and enable our workers to work from anywhere. Our workplace design has mostly departed from the traditional walled offices and partitioned workstations. We are also having internal debates as to how a seat is defined. As you have pointed out in your article, many work are done on our patio space, cafe booths, couches, and so forth when people come into the office. There is now a blurred line between “work space” and “support space”.